March starts off harmoniously; depth, compassion and intuitive insight form a stable unit. But after new moon in Pisces the mood begins to change, it becomes more aggressive, purposeful, active. The emphasis on prudence by water and earth elements is replaced by the boisterous sparkle of fire and air elements. From the 20th onwards there’s no stopping: impulsiveness and hot blood take over the reins. Being alert, you can use this sprightly energy for yourself, without leaving a mess in your wake. Even radical change and new beginnings can be in accordance with the heart. True, there is no way back, and change is the order of the day in almost all areas of life. Interestingly, though, change is now also the order of love. This means our idea of what love and harmony is has to be radically revised. 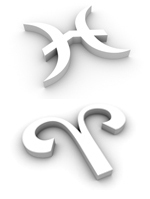 Mercury, moving direct from mid-March onwards, demands honesty that must be communicated with sensitivity. However, disillusionments are hardly avoidable. In all this hurly-burly, Saturn is attributed with hitting the brakes – often unwelcome, but objectively necessary, so that in the end not everything goes down in the flames of passion. Aries: In the first half of the month the mild pulse of February continues; consider it as the calm before the massive storm that breaks loose by mid-March. Virtually all areas of life are affected by it; now nothing remains as it was. The more you flow with the turbulent energy, the more creative the effect can be. Brace yourself for Saturn’s braking influence, which will also make itself felt – often just when you think you can fly in full sails through the finishing line. Taurus: During the first three weeks of March Neptune remains the dominant force, making things run smoothly, arousing compassion and civility, while you remain centred and powerful. From the 21st on the tide turns: an extroverted, dynamic energy demands radical changes. The rebel within you pipes up, wanting to act independently, and is uncompromisingly committed to its own goals. Dare and trust in Saturn, who will take care early enough to ensure that things do not get out of hand. Gemini: Later this month, processes initiated during February come to a mostly satisfying conclusion. Some concessions will be needed though, so let go of unrealistic expectations. In early March there’s a tremendous deepening and stabilising in your relationships. In the last third of the month, however, there will be delays, obstacles and frictions in all walks of life. It is alright, there’s nothing you’ve done wrong. Look for small step by step solutions, the big sweeping blow is not on for now. Cancer: With new moon, the focus on independence and powerful assertion dissolves into surrender; special emphasis is placed on spirituality and the fine arts. The energy is more introverted, but neither lax nor colourless. Commitment, ingenuity and optimism are in demand and are fruitful. With full moon relationship issues come into play. It is about a new perspective on love and relationships, about openness and more freedom. Don’t insist on your idea of harmony. Maybe it can be totally different! Leo: A harmonious start into March. Until the 20th simply stay with the flow. But after that your entire life force is needed. The trick is to get other people on board in spite of an enormous amount of energy and creative fireworks. Even when sparks fly and maybe daggers drawn, always remain connected with your generous lion heart and invite others to join the game. At the end of the month now and then a spanner could be thrown in the works. Do not get annoyed, just find imaginative solutions. Virgo: March is a month of learning, and especially in the area of relationships, where it is about a wider horizon. Learning or communication processes that began in February determine this month. If something is very important to you, don’t give up; let communication neither dry up nor break it off. It is worth trying again and again and stay with it. Miracles won’t happen, but now you can lay down a sound base that will go on stabilizing and strengthening until autumn. Libra: The energy of the first three weeks is collected, calm, and harmonious. Connections are pleasant, communication is good. But then there is a radical change; all of a sudden it is about becoming active. The diplomatic balancing act of turning things over in one’s mind is past. Uranus demands freedom and for you to give active expression to this freedom. Go new ways, or dare the leap into the unknown. Not everything will go smoothly, but the stumbling blocks and counter-forces are part of it; they will make you stronger and the result even more refined. Scorpio: For you too the first three weeks primarily provide positives. But overall, you find yourself at a turning point. Developments that began late last year now move into a process of several months during which the wheat is separated from the chaff. This is first of all evident by problems and minor issues showing up that you have to take care of. Powerful pageantry, or appealing to the ideals of the opposite side are of little help. Your best ally is your intellect. Find good arguments! Sagittarius: Knowledge and communication processes that began in February will now be brought to a satisfactory conclusion. It’s about questioning your insights and beliefs or to have them questioned. Saturn, currently in the role of the brakeman, badgers you. Take a deep breath and don’t give up. At play are love, trust, realism and a willingness to stake everything on one card. To give justice to all four factors is the challenge of this spring. Capricorn: In the first two-thirds in March everything flows, it is a time of harvest, of success. Challenges are in store for the last third of the month. Whatever happens avoid power struggles, but don’t cave in. You can trust your insights, yet you might feel you are running against resilient walls. Best thing to do first of all is pause. What is actually going on? Only after this survey, proceed step by step, and after each step assess the situation once more. Aquarius: For you the energy culminates in the second half of the month. Don’t let things get you down, fight, do something! Take your will seriously and commit yourself to your affairs. Protect what is valuable to you from attacks so that it can develop and burst into flower. Mental clarity is a good basis for this, but not enough to achieve tangible results. Your relationships, too, require new answers now. New goals may require separations or other associations. Pisces: In the first week of March every area of life is under a lucky star; you are energized, grounded and inspired. Matters of the heart could become a little melancholy, but once you verbalise your moods and communicate, they turn into resources. By the end of the month you have the chance to practically stumble over solutions you have been searching for weeks. You realize that they had been there all the time, but could only become apparent from a wider perspective.